How do I file a Workers’ Comp claim in North Carolina? An employee who is injured on the job in NC should give their employer written notice of their injury as soon as possible, but not later than thirty days after the injury. It is best to provide notice on a Form 18, which can be obtained from a NC workers’ comp lawyer or from the NC Industrial Commission website. A copy of the Form 18 should also be provided to the Industrial Commission, which will open a claim. The employee should take care in completing the Form 18, particularly with regard to how the injury occurred. 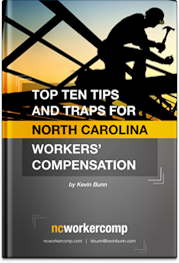 Workers’ compensation in North Carolina encompasses only injuries by accident. So the employee should be certain to fully and accurately describe the events leading to the injury and accident, or risk the claim being denied. For example, let’s say a worker was moving a box from a stack, the stack started to fall, and he hurt his shoulder trying to catch the stack of boxes to prevent them from falling. If that worker reports that he “was moving a box and injured his arm” he may find his claim denied. A report that he “hurt his arm trying to keep a stack of boxes from falling” is more likely to be accepted by the employer or the workers’ compensation insurance company. If you have questions about how to complete the Form 18 it is best to consult a NC workers’ comp lawyer. An injured worker generally MUST file a CLAIM with the INDUSTRIAL COMMISSION within two years of an accident. In the case of an occupational disease, the employee must file the claim within two years of being informed by a doctor that he or she has a job related disease. This two year deadline is critical. After it is filed, the employer or its workers’ compensation insurance carrier must formally accept or deny the employee’s workers’ comp claim. Frequently insurance companies will seek to avoid this responsibility for tactical reasons. An injured employee can request a hearing before the Industrial Commission by filing a Form 33 any time they believe they are NC workers’ comp benefit benefit that is not being provided. If you have questions about how to File a Workers’ Comp Claim in North Carolina please feel free to call or email for your free consultation with a NC workers’ comp lawyer.